Should cost about 300UAH to get to centre from the Kiev to the Airport by Taxi. Icy is an understatement – you’ll see what I mean when I get some pictures up here, crazily thick ice in places – I lost count of the amount of times I almost slipped over! Good prices on Vodka in the Duty free! More notes and some photos to be posted up in due course. The night before I was running about 3-4 hours behind where I wanted to be in the office, I should realise trying to multi-task doesn’t work and should just have more courage to bin things off I know I’m not going to have time to do properly! Although Enterprise rent a car weren’t helping either – delivering a car that should have been at work for 12 at gone 6.30pm! Anyway so the night before was quite a late one (later than it should have been for a 4am start). As I went to bed the missus said “its snowing again” my heart sank as I looked outside and saw that the Clio Estate (funny car to get as a hire car, and amusing as at one point it was on my cars to consider buying list) had been completely covered in Snow (an inch or so) and that the snow was coming in quite fast at a 45 degree angle. Luckily the snowflakes were quite small so I figured it would probably stop or turn to rain. On waking up in the morning to discover our Velux skylight windows completely coated in Snow I knew I was in for a “treat”! Got myself together and got out to the Clio to discover it coated in a good 3-4 inches of what turned out to be very fluffy and annoying snow to get off the car. At least it wasn’t icy. And so at that point I thought to myself; if I can get the car moving okay on my untreated road and on to the main road through the village ok then the trip should be safe enough. Clio actually handled the snow much better than my Passat (which is lowered and has wide sporty 17” wheels) reversing okay through the deep snow (although I must admit I did have to use a back and forth rocking motion to compact the snow enough and build up enough momentum to get going. I reversed back to leave the patch of almost clear tarmac underneath (I’ve never cleared so much snow in my life over the last few days to keep the car and parking spaces usable) which would give me a reasonable area to get going later on. Having warmed up/cleared the snow from the car and assessed that it would move ok, Kat and I had a discussion on how safe it was for me to go and we checked if the flight was still running; it was and I decided if I drove carefully to J13 of the M4 (which would be the worst of it) then the journey should be ok, if not then I would attempt to return (or park the car somewhere safe and walk back to the house). So I got going with a bit more rocking back and forth and delicate use of the clutch and 2nd gear and off I went, changing up into 3rd/4th as soon as possible (but leaving the engine as close to tickover as possible). Things were okay; the car was broadly going were I wanted it to with careful steering movements, and the fact that it was 5am mean’t that there was very little on the roads or anyone around (had it been later my decision probably would have been to stay at home – the snow would have been thicker and more people = more risk). I tested my steering control and brakes on the wider section of the road through the village. All was going pretty well – even going down what I call “Wheelspin hill” was ok. All was fine until I got to a mini roundabout when I forgot the brakes were quite different in Renault Clio’s to VW Passats, even though I slowed down way before it (changing down through the gears to use engine braking/deacceleration), the car just slid straight across the middle rather than around the mini roundabout. Luckily the car stopped way before the bushes that were on the edge of the road (the car stayed on the road). I was a bit shaken by this but decided that as I was now half way to the M4 that I should very carefully try and get there. Quick manoeuvre and some pep talking to myself (“Come on Ollie you can do this, you’ve driven in worse*”!!) and I was back on track, using a 25 – 40mph pace on a road I would usually drive at 50-60 in the summer (I would have gone slower had it not been for the need to maintain momentum going up hills). My route has me drive over the M4 on a bridge before I join it a mile or so before I get to it, so I was able to confirm that it was reasonably clear with the speed of the traffic moving along it. Was reassured by the fact that when I got to the M4 junction it was reasonably clear and was certainly a lot safer to drive than the B road from the village. *Even though actually I’m not sure I have driven in worse! The M4 was actually quite a lot more scary that I thought it would be, 1.5 to 2.5 of the lanes were clear – the gritters and lorries driving through the night doing a good job of keeping it like this. Still I had people tailgating me in the middle lane when I was going 60 (before Reading junctions this was the safest maximum speed in my judgement). As I approach London the snow reduced and the road improved (although I think some drivers were completely misjudging things; someone in a Passat estate – the irony – came steaming past me in the 80% clear outside lane doing at least 80mph). Got to Heathrow drop off point not problem although once in the Rental cark park I overshot the turning for the drop off point (didn’t see it in the snow) which mean’t that I slid to a stop a little, but I was there now and just did a small shuffle to get the car where it needed to be in one piece without a scratch. So this was to be my first outing using T5 of Heathrow – quite impressed by I (but I imagine many people weren’t when it first opened due to the computer glitches. Found my gate and then got on to a bus to the plane. 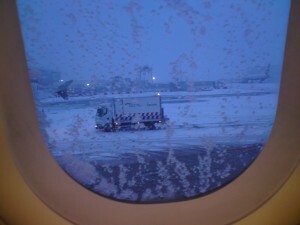 With de-icing done the Captain tells us that there will be delays due to French ATC being on strike! In the end we take off 2 hours after scheduled. I downloaded it thinking I’d be able to use it on the plane – no such luck – oh well will teach me for trying to be so whizzy! Captain tells us local weather is -6C and 15 mph winds from the north with snow, so pretty much the same as home then…!